A pulled hamstring is described as a tear or strain in the muscle triad situated on the backside of your upper leg (thigh) typified by abrupt, sharp-shooting pains or involuntary, mostly agonizing contraction of muscle in the back of the affected leg. Treatment for a pulled hamstring muscle is based on how severe the condition is. Grade 1 hamstring pull is characterized by stiffness in the backside of the upper leg along with a discomforting sensation felt when one tries to walk. Generally, there is least swelling as merely small muscle tears have developed. Grade 2 hamstring pull is identified by failure to make the knee straight, limping while walking and perhaps, excruciating, abrupt, sharp localized pains intermittently felt when doing some physical activities. Due to partial muscle tear there is greater likelihood of palpable pain in the affected area which appears swollen. Grade 3 hamstring pull can considerably impact walking, cause acute pains, particularly when one tries to bend the knee. Mobility aids like a crutch might become necessary. The strained region would apparently and instantaneously swell up due to the severe tearing or total rupture of the hamstring. Principles of the protocol – P(Protection). R(Rest). I (Ice). C (Compression). E (Elevation) must be started instantaneously after the strain is experienced. The feet must be propped up and gel packs or instant cold packs applied on the strained area for about twenty minutes, many times daily for the initial 2-3 days. Wrap self-adhering, elastic support and light-weight compression bandage or sensi wrap, though, be wary about not wrapping it too tightly. In case you experience pain while walking then grab onto a mobility aid. Resting the affected leg often, though avoid becoming totally sedentary and try to be mobile which will be of assistance. 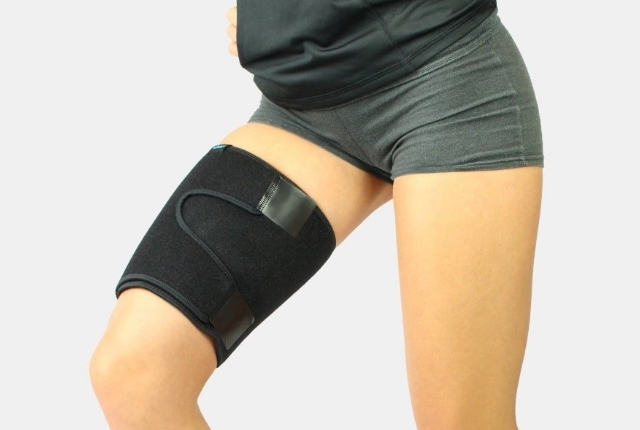 This form of strain is treated at home with the basic procedure that has just been illustrated while also incorporating some basic seated knee extension exercises for the initial 24 hours or so. Try static hamstring stretching (internal and external rotation) which is a proven way to treat such pulls and strains. For static stretching (internal rotation) begin by being seated on the ground with one of legs straightened out while the other one is folded and the sole of that feet touches the thigh of the outstretched leg. The straightened leg is then rotated inwards and leaning forwards at the hips till one senses stretch underneath the upper leg. After holding the position for half a minute the same steps are repeated all through the day for four or five times. In static stretching (external rotation), the starting position stays same, however, the outstretched leg is now rotated outwards while one leans ahead at the hips till a pang is felt underneath the upper leg. Stay in this position for thirty seconds and perform five repetitions all through the day. Avoid bouncing while doing this exercise. After 72 hours, one then switches to heat therapy and exercises like standing hamstring stretches are included. These can be performed by standing with the leg to be outstretched placed just ahead of the other one. One then tips ahead from one’s hips while bending the knee of the feet placed back. Hands can be placed on the bended thigh for balancing oneself. Try leaning ahead to a greater extent or tilting the pelvis ahead till stretch is felt. The position is held for half a minute and repeated often through the day. Massages might additionally be offered for strained tissues. When completely recovered then one can jog lightly along with the above exercises and slowly revert to regular routine. Due to muscle fiber partly torn, this form of injury takes nearly sixty days or so for healing. The initial 72 hours of recovery period stays the same as above.The subsequent 4 or more days would involve performing low stretches though avoid pushing to the extent that pains are sensed. Add basic knee extensions like one-legged extension performed by being seated erect on a chair with feet placed flattened on the ground. Left leg is extended out till parallel to the floor and held for 5 seconds prior to placing it down. Redo with other leg. Try reverse leg raises along with massages that deploy deep, lengthways stroking as well as kneading for improving muscle pliability. The leg is moved for engaging muscles whilst concurrently massaging the stricken muscle for softening and mobilizing tissues. Heat therapy is initiated and exercises would be recommended to strengthen muscles of the upper leg and groin. Leg curls exercise with light weight, standard hamstring bridge exercise and mobility drills is advised in the third week. One can start to swim or cycle on every second day as the rehabilitation continues and at the conclusion one can commence doing intense leg exercises and eventually do regular activities. Apart from the standard resting, icing and compression, elevating the strained upper leg for at least seven days along with mobility aids for moving about is necessary. Thereafter, heat therapy and exercises mentioned as in Grade 2 are followed for the subsequent fortnight or so. The exercises can be then become more intense as one slowly returns to regular routines. The physiotherapist and physician in unison would chart out a rehab program tailored for the person which should be religiously followed till the end to ensure complete recovery.